Cars can't fly, but these ten videos chosen by Jalopnik readers show the most daring, most foolish, most memorable attempts to get airborne in ground transportation. What’s The Best Car Jump Video? that was one sturdy ramp! didn&apos;t even budge and shot him up in the air real quick!! What happened? : Are you bored? Do you have a car and a questionable sense of indestructibility? This is what you'll end up trying to do – catch massive air in a complete junker. What happened? : This mid-drift launch at Ebisu demonstrates that perfect car control, not just brute force, can make a perfect jump. What happened? 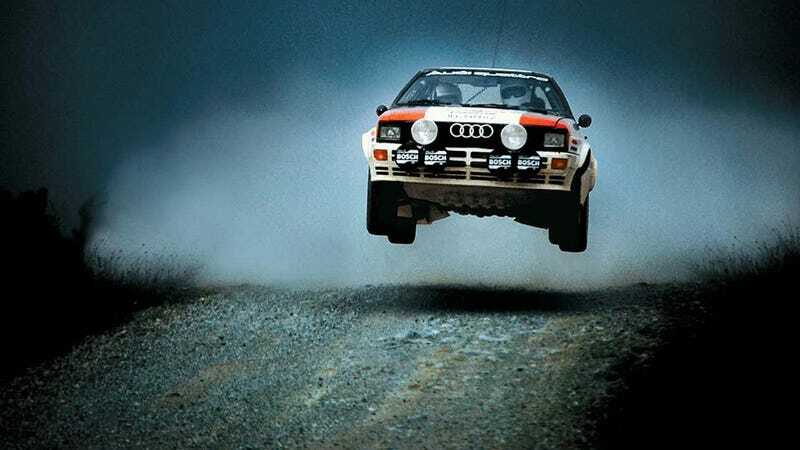 : Rally stages are full of crests and "yumps" that should not be taken flat out. Hearing the sound of important pieces of Saluk's Mitsubishi crack on the landing explains why you should lift. What happened? : Before Dan Runte jumped Bigfoot 202 feet over a Boeing 727, monster trucks just crushed cars and made little in-stadium leaps. This jump changed everything. The 136 MpH jump on the Leitholm Stage in the 2007 Jim Clarke International Rally. What happened? : This is Barry Johnson on the 2007 Jim Clark International Rally.The landing apparently bent the rear of the car down six inches, broke the shock absorbers, and sent both driver and co-driver to the hospital. What happened? : Yasmine Aida Villasana did not intend to launch her Chevy Impala over a toll booth on Memorial day 2010, but that's just one more thing that can happen to you when you drive drunk. She only shattered her wrist in the fiery landing. Rednecks, beer, Sidekick, woods, successful. What happened? : You need a serious safety crew, a sizeable budget, and many long hours of preparation to pull off a big jump with any guarantee of safety. This video shows none of those things. Suggested By: 87CE 95PV Type Я says GO CELTICS GO! It can only be, the Civic that was passed by a flying car. What happened? : At the 2010 Autoquad races in St-Ferdinand, Quebec, one car actually passed another car while airborne. Take that Zanardi. What happened? : In 1976, Canadian daredevil Ken Powers did not jump his rocket-powered Lincoln over the St. Lawrence River, as he had planned. With a $1 million budget, "The Superjump" was set to be one mile long, but it didn't work. It wasn't so much a failure, but rather a lesson for all humanity. What happened? : Tanner Foust makes every childhood dream come true, launching what is basically a life-sized hot wheels car down a ten-story drop and soaring 332 feet through the air.